A really good black sheep! When this game first came out, many people were wondering why it deviated from the first game; Goombas were replaced by Shyguys, enemies were tossed instead of stomped, the Mushroom Kingdom was replaced by Subcon, and Bowser doesn't appear at all! Why the changes? Back in 1986, a different version of Super Mario Bros. 2 was released for the Famicom Disk System, and when the good people of Nintendo of America tested the game, they gave it the reject stamp, stating that the game was too difficult and looked too much like the first game. They feared that such a game will frustrate and alienate the American audience. The R&D of Nintendo of Japan (a.k.a. "The Treehouse") brainstormed for an alternative, and found another Famicom Disk System game called "Yume Kojo: Doki Doki Panic" that can't be released as it is due to licensing issues. Why not take the game and plaster it with Mario and his friends? Nintendo of America liked the idea and gave it a few tweaks here and there to make the game fresh for the public. 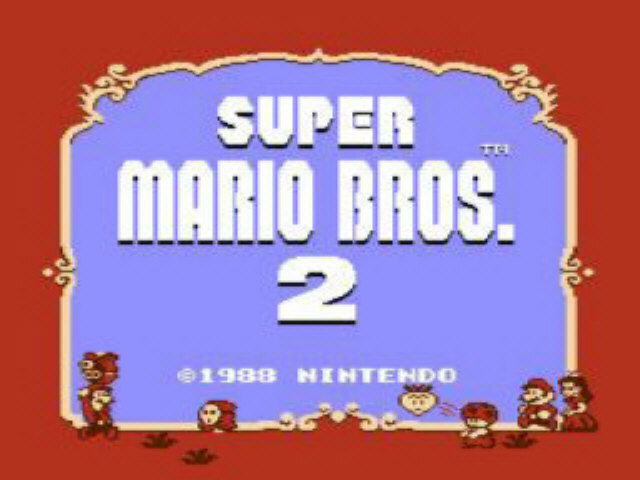 The result is the western version of Super Mario Bros. 2, dubbed a black sheep of the Mario series due to its gameplay and setting. This game didn't get released in Japan until 1992 and was renamed "Super Mario USA" because of its origin. Mario's been having strange dreams lately. In one dream he travels up a long stairway. On the top he enters a door that leads to Subcon, the land of dreams. As he saw the horizon, he heard a small voice telling him that Subcon is held captive by the veggie-hating Wart, and before he could react, Mario woke up and found himself fallen out of bed. The next day the good plumber and his friends decided to have a picnic, only to find a cave ultimately leading into the exact same world that Mario saw in his dreams. The four heroes decided to take it upon themselves to rescue Subcon and restore peace to the realm. You play as one of four characters with different strengths: Mario is the most balanced, Luigi is the highest jumper but has poor traction and strength, Toad is the worst jumper but best runner and plucker, and Peach is the weakest but can float for a little over a second. 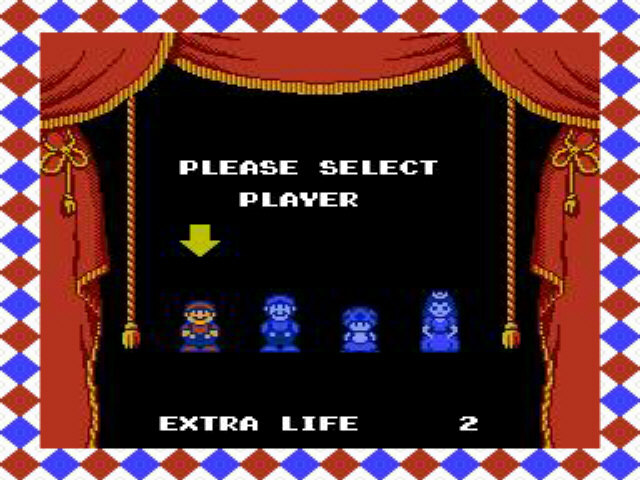 Once you pick a character, you stick with him until you complete the level, then you get to pick either the same character or another one. The object of the game is to survive from A to B without losing all your lives. You have a health bar that is increased by picking up mushrooms in Subspace. 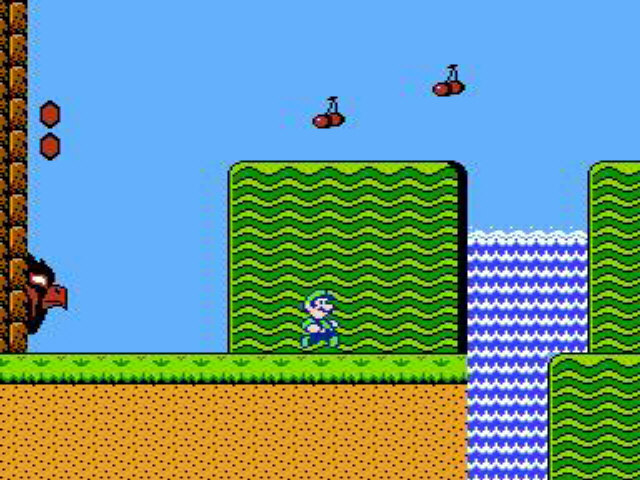 You walk/run, jump, duck (which boosts your jump if the character is flashing), and pick up enemies to toss them at other enemies. You can also pick up little red grass patches that contain veggies to toss, magic bottles that turn into doors, POW blocks that shake the immediate area, Koopa shells that mow anything that gets in the way, and coins that are plucked from Subspace and used for the end-of-level bonus. In some places you can go down bottles much like the pipes from you-know-what, ride on a magic carpet, and even dig in certain sand! At the end of the level you'll have to pick up the crystal ball and enter the Hawkmouth, and usually the ball is guarded by Birdo, a dim-witted, egg-spitting dino who is a gender-confused male, according to the Japanese. At the end of every world is a boss that takes multiple hits to defeat. This isn't the Mushroom Kingdom, but there's never a dull moment here! The graphics did very well in its day, and it still looks good even today! In Subcon there's flatlands, cloudy areas, deserts with pyramids, caves, mountain peaks, tree hollows, and more enemies and thugs than you can shake a stick at! Each place and enemy is more detailed than the first game, and who doesn't want to watch the Hawkmouth open wide? Mario and his buddies also look cool, especially Luigi donning his now-famous green duds for the first time (believe it or not)! The red grass patches sway in the breeze, and even the waterfalls fall naturally. The music doesn't exactly have the fame of the first game, but that doesn't make it any less catchy. From the happy ditty of the main overworld to the final boss, you can't blame the sound designer for goofing around, even though Mario's famous theme is heard only in the Subspace areas. In my opinion, the most memorable tunes are the main world and the bosses. Who doesn't remember that? Despite its oddball status, this game became a hit back in its day and is still a hit today. 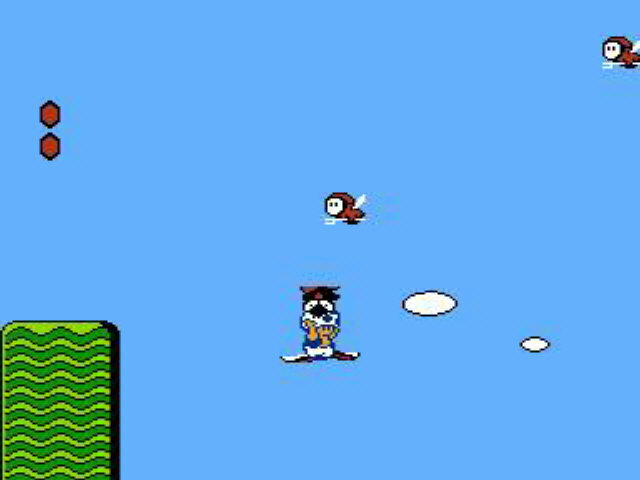 The playable characters, wacky enemies, cool worlds, and happy music make up for its different (although great) gameplay. 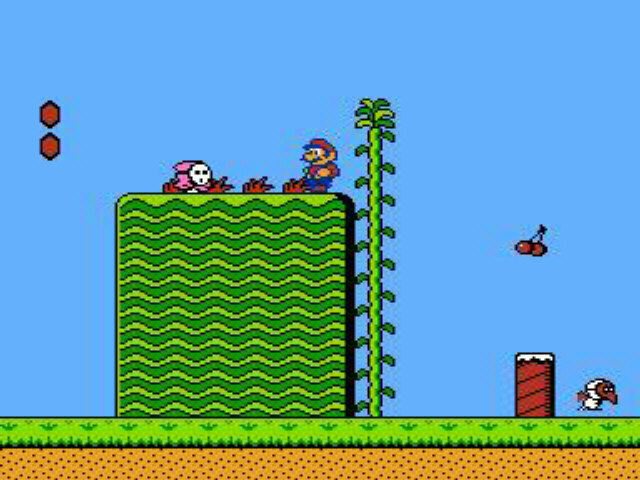 Many Mario enemies have made the debuts here, such as Shyguy, Birdo, and Bob-omb! Never underestimate a game merely because of its status; this game has paved a foundation for many Mario games to come and, to this day, is still one of the greatest hits to grace the system that revolutionized the video gaming industry: the Nintendo Entertainment System.